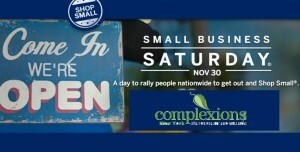 ‘Tis almost the season…and at Complexions we are excited to help you get your holiday shopping off to a good start by being a proud participant of Small Business Saturday on November 30th. 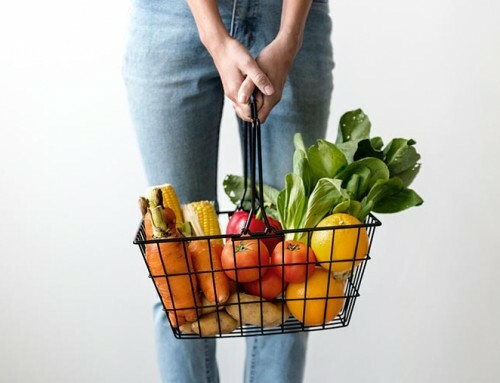 During this annual event, sponsored by American Express, shoppers nationwide are encouraged to support their favorite locally-owned businesses. Amex cardholders will receive a $10 statement credit when you use your personal or business American Express card at Complexions on November 30th. Visit www.Facebook.com/shopsmall & register your card. 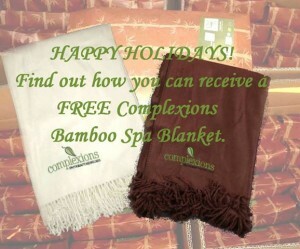 Use your American Express Card to pay for your Complexions Gift Cards (minimum purchase $25). Enjoy a $25 statement credit on your American Express card…and the below “extras” from us! Receive a FREE $20 Spa Gift Card* AND a spa bamboo blanket (value of $85)** with each $250 Gift Card purchased (while supplies last). 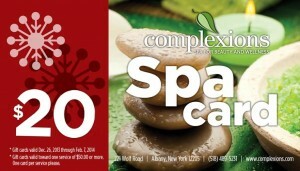 *The $20 Gift Cards can be used towards a spa service of $50 or more, and are valid from January 1, through February 7, 2014. **Blankets available while supplies last.